Χριστός ανέστη! May you continue to enjoy this festal time. Bonald, of Throne and Altar, recently posted a provocative piece on The Orthosphere, “The other Abrahamic religion that will never want to be our friends either.” Provoke it did—so much so that Bonald deleted it. Bonald tactfully but frankly brought up several aspects of Jewish-Christian relations that are verboten in contemporary polite society. I commented, but some of my comments disappeared with the post. There followed a discussion that makes for an interesting read for those who have an interest in Jewish-Christian / Jewish-Western relations and who despise taboos. I do not have a fixed opinion on the “liberal WASP” counterargument, but I do not think that Kristor and others are acknowledging the subversive potential of a permanent “Other” that invariably rises to the elite in its host society. The “liberal WASP” argument notes that liberal, degenerate Protestants are as destructive to American society as liberal, secular Jews due to their political opinions. Therefore, it is reasonable to hold that liberal Jews’ assaults on traditional culture result from their leftist ideas rather than from any group hatred toward or alienation from the majority population. I occasionally refer to this argument in my posts. An obvious objection is that rabbinical Jews as Jews organize for leftist causes, meaning that individuals and organizations that represent Jews as Jews often attack traditional Western, Christian society. For example, Anti-Defamation League head Abraham Foxman’s long career as an advocate for the tolerance and acceptance of Jews gives one the impression that the same tolerance and acceptance should not be granted to traditional Christians. However, we know that leftists use whatever means available to them to advance their causes. So, one could argue that leftists who happen to be Jews choose to organize as Jews to promote their ideas behind an identity that most Americans see as an irreproachable Victim Group. Leftists exploit children and women in the same way—why not rabbinical Jews? I address your question in my linked posts. The permanent state of “otherness” comes from Judaism itself, where to be Jewish is to be a nation apart. Your point is that the religious children of the rabbis are not problematic, but rather the sowers of discord are secularized Jews. I largely agree, but I would argue, based on personal experience quite unlike Kristor’s and on a cursory examination of American politics over the last few generations, that even secularized Jews persist in a state of—to use a favorite concept of an early secular Jew—alienation from the dominant society. With Abe Foxman and his ilk, it is always late imperial Russia, and the goyim are always a crazed mob ready with pitchforks and torches. As far as demographic destiny, the Left does not need to reproduce when it can re-educate. My point above is that Jews will always come to occupy places of influence (when allowed) because of their exceptional qualities, and hence they will be in a position to re-educate as they see fit. When rabbinical Jews fear and loathe their host societies, they make a dangerous elite—for the host society and, ultimately, for themselves (when the reaction finally comes). And shame on you for mentioning the Cardinal Who Shall Not Be Named! Well, sometimes, we must speak of the devil. Bonald, did you just “Lowry” yourself? What a pity. I agree with Joseph above . . . we ought not to assist the Masters of Discourse by “pre-emptive obedience” (such terms do appear more impressive in German). Also, the Jewish Problem is a real issue, and those who wish to ignore it won’t thereby make it go away, just like the dominant American political establishment’s fantasies won’t make the problems of our particular ethnic diversity go away. One commentator mentioned in the deleted thread that the Orthosphere had “jumped the shark” with your entry, and another mentioned that discussing such issues might scare away potential allies or converts. Yet, the problem remains, and being unwilling to discuss it openly, rationally, and honestly cripples us—leaving us prey to the “fever swamps of the anti-Semites” or to the white, conservative, Christian hating leftists, not a few of whom are rabbinical Jews. Moreover, such delicacy and misplaced tact are insulting to Jews. Men like Bernie Goldberg, Michael Medved, and Andrew Klavan—those allies and converts that we treasure so highly—are not girly whiners. Hopefully, they can distinguish between our discourse and the agenda of Mr. MacDonald. I cannot really answer your chief question since I don’t frame the issue in the same way. Rabbinical Jews are not a cleanly marked “Other” for me, for personal and religious reasons, as I have mentioned in my posts about them. On a personal level, I am a total Heebiephile (though NOT a hebephile!) because I admire, respect, and share many characteristics that are peculiarly abundant among the children of Jacob. There is no other ethnic group with whom I would rather spend my time. Religiously, I respect rabbinical Judaism as an ethically rich, pious tradition that is historically and doctrinally close to my own religion. I acknowledge its good aspects and blithely disapprove of its shortcomings—similarly to how I respond to mainstream Protestantism. On matters of religious “diplomacy” and religio-socially, though, I quickly lose patience with rabbinical Jews because truth and justice trump ethnic chauvinism and personal preferences for me. This might be a family trait. Last week when I was home, I attended a passion play at a local Roman parish with my father. I was pleased that the production kept the Barabbas scene with the ugly mob. I mentioned this to my father afterward, noting how “offensive” the gospel was to those in the rabbinical community who have taken upon themselves the role of official offendees. To which my father, a man of the most judenfreundlich tendencies, retorted in a way rather unkind to the Foxmans of the world. The only other time that I witnessed my halbjude father express anything negative toward the Jewish community was during the hysterical and bigoted reaction to The Passion of the Christ—for similar reasons. Given the Orthodoxfest on these threads, I want to note that some of the most hateful, anti-Christian rhetoric that I have ever witnessed has been sputtered by super Orthodox rabbinical Jews. Yes, secular Jews are far more likely to support monstrous leftist policies, but they are far more cordial . . . in the way that Anglicans are preferable to Westboro Baptists. Religious fanaticism—self righteousness, not a spirit enlightened by love and wisdom—creates ugly souls. Liberalism is a form of degenerate charity, but I prefer it to cold, proud legalism. Sloppy theology is likely less harmful than nakedly demonic theology. Mr. Nicoloso, you wrote, “for every Abe Foxman, there are probably hundreds of Katharine Jefferts Schoris.” This is a continuation of the “liberal WASP” counterargument. First, you have to consider quality in addition to quantity. Sure—there are probably more WASP fools in Massachusetts alone than perverse Jews in the entire country, but look at the caliber of the threat. One Foxman is more estimable a foe than hundreds of Shoris. Look at what that man hath wrought. Consider the ethnic make up of the elite in the media, academia, the political establishment, and NGOs, and you will quickly see why the fever swamps come up with their conspiracies. Rabbinical Jews, observant or not, are at the center of American life now. However, that community still continues to behave, in large measure, as if they were still an oppressed outsider. I think that Sailer made the point that American Jews have become the elite without having acknowledged the cultural responsibilities of being the elite. Would the same be true of the “liberal WASPs” of the nineteenth century? Which of those American patricians Who Knew Better actively worked for the dissolution of the American people? Second, instead of comparing the rabbinical Jewish community in America to liberal WASPS, we should compare them to American WASPS in general. Which community, as a whole, is more harmful to the culture, to welcoming Christians to having a place in the public square, and to the traditions of Anglo-Saxon constitutional republicanism? We do not know exactly what has caused such dismal forces in the Jewish community, but we cannot deny that such forces are far more prevalent among American Jews than among WASPs. Moreover, the respective talents and organization of Jews magnify their influence. Therefore, what traditional, wise Jews we get on our side are a significant boon, like manna from heaven. Yet, not many join the side of guarding and preserving our civilization. Hence, the Shoris of America enjoy the considerable intellectual, creative, material, and political power of the American Jewish community. The American Left has successfully tapped the first round top demographic pick for its roster. To use Kristor’s policy test against his genteel and Christian disposition, imagine the American regime without the descendants of immigrants from the Pale and compare it to our actuality. It seems pretty clear to me which America would be stronger, more united, and more sane. Though I also suspect that it would be far less interesting, learned, and entertaining. Such thoughts trigger fears of Judenrein among us, but they clarify the situation instead of indulging in warm fuzzy hopes. Bonald’s original post brings up the Jewish Problem, and his taking it down doesn’t help to resolve our mess. To Franklin [who had mentioned that future Jewish communities would be less intelligent due to the relative rise of the anti-intellectual Hasidic population]: the traditional rabbinical communities are not unintelligent. They are simply uneducated (in the modern, worldly sense) and uninvolved. Don’t you think that they will continue to be a fount of genius, which will only be recognized in the ones who leave their insular worlds? If traditional, observant life were “moronogenic,” then please explain the bright lights that have emerged since emancipation. There is no Jewish Problem, and I think anyone who uses that phrase is asking for trouble. There is a problem of political correctness which is associated with education and intelligence and since Ashkenazim have both in abundance they are naturally disproportionately affected by it. . . . I think that Henry makes a significant point, and it is similar to how I usually explain the leftist orientation of Western elites in general. Our society is dominated by leftist ideology, and clever, educated people imbibe that ideology. Moreover, as my friend Andrew often points out, it takes some intelligence to rise above convention and to question the standards of one’s civilization. When these bright, young folks notice the superficial irrationality of tradition, they begin their journey leftwards. However, it takes a lot more intelligence and insight to see how such conventions accord with nature and hold societies together. Hence, there are fewer intelligent conservatives than intelligent leftists, but they are far more profound and rationally grounded in their ideas. I do not agree with your trepidation toward the monstrous Left and its taboos. “Asking for trouble”? Faugh! I’ll explain what I mean by the “Jewish Problem.” It is basically what Auster says, and we all know what a raving Judenhasser Auster is. In any society, ethnic, religious, linguistic, cultural, and class divisions cause tension and stress social cohesion and unity. Of course, the more healthy and robust the body politic is, the better the regime is able to deal with such problems. There are also many mitigating or aggravating circumstances that lessen or heighten the impact of those stresses. Unfortunately, leftist ideas are among the latter; they turn ailments into cancers. Yet, liberalism does not make the ailments problematic. For they are natural challenges that inhere in diversity. A society with a self-separating subpopulation will often have some level of social conflict. There are not many ethnic differences between the Amish and their normal American neighbors, but every year there are criminal cases that result from harassment or violence between the two groups. The greater the difference, the more likely the rate and severity of conflict. Consider the less than rosy relations between American whites and blacks that no amount of manipulative advertising, institutional indoctrination, and media framing will change. The gypsies have been in Europe for centuries, and yet there remains enmity between them and the host population. Why, then, would I mention a specifically “Jewish Problem”? Unlike many other groups, Jewish communities do not engage in criminality at higher rates than their host population. They do not become a parasitic class that lives by a mendicant or criminal code. On the contrary, they tend to excel. Their learning, intelligence, industry, creativity, and organization allow them to climb the social ladders wherever they settle if their hosts allow them the freedom to do so. This is the Jewish Problem. It is not a special perfidy. It is not a genetic disposition toward destruction that only Jews have. There is no worldwide Zionist conspiracy to dispossess the closest competition. Rather, Jews are a self-separating subpopulation that invariably rises to the elite in an open, meritocratic host society. That is an inherent recipe for disaster. It is a real problem, and it must be discussed. We have seen the alternatives too many times. Only by acknowledging the problem can we take steps to mitigate it. The Parsis of India are in a similar situation, but they and the Hindu population appear to have developed a sustainable system that works for them. America before our cultural revolution also seemed to have kept a harmonious way. Sure, there were country clubs where Jews could not golf. Sure, Jews were overly represented among American Communists. Yet, overall, the relations were decent. Jewish Hollywood celebrated Christian America, and American Christians welcomed rabbinical Jews as fellow citizens without apologizing for their own cultural hegemony. We need to return to something like WASP hegemony, but we cannot even begin to take the steps that will ensure the longterm safety, peace, and social inclusion of American Jews until we recognize and proceed to deal with what you, Henry, find unthinkable. Thank you for your responses. Only time will tell what rabbinical Judaism will look like in a century. Imagine yourself at any given point in time and think what would be reasonable to expect in the future at that moment. Then, think about what followed. History is usually surprising. I never thought about Jews and Chinese food that way. I just assumed that Jews ate Chinese on Western Christmas for the same reason that the Parkers ate Chinese in A Christmas Story—those joints are the only places open. Maybe the film was just Jewish Hollywood’s dastardly covering their tribe’s tracks by hoodwinking the gullible goyim!  I spent Western Christmas in New York City one year, and I took my mother to Joe’s Shanghai for dinner. It was a very festive atmosphere. * Liberal German Jews meshed well with conservative American ideas (“right liberal” in Auster’s terminology). * German Jews from the nineteenth century had better relations in the old country with the majority population, while immigrants from the Pale hated and feared non-Jews due to the pogroms. * German Jews were emancipated assimilationists (Reform Judaism is somewhat Protestant Judaism), while the folks from the shtetls had no experience of or desire for assimilating. Such would explain their varied responses to American society. * The earlier wave was accepted more into the mainstream of the American Midwest than the later wave that settled in East Coast ethnic ghettoes. * The political climates where the two groups settled determined their orientations, just like the Irish. Cincinnati Jews often registered as Republicans while New York Jews became Democrats with few exceptions. * “Conservative” and “progressive” tendencies within one’s religion do not necessarily match such tendencies toward outsiders. Do you have any insights about the issue? I am reminded of Nietzsche’s criticism of Christianity as a new Buddhism. Remember, we have an incarnational religion. The nihilistic interpretation of the gospel is for the gnostics, not for us. Do not eschew your English heritage as a Buddhist consolation while you witness evil men mar your civilization. Rather, redeem your civilization to the extent that you can. The Left hates Christendom. It thus hates England. You do not hate your mother because she is not Jesus, though the gospel leaves itself open to such Buddhist interpretations in many places. Resist and rejoice. And sing “Jerusalem” to yourself in moments of doubt! I don’t think that problem solving ability, which is what we basically mean by intelligence, is a cultural bias. Different individuals and different groups have different gifts in different distributions. Among such gifts is the ability to notice patterns, absorb information, make distinctions, and propose solutions. That is something that we should want for our society. Of course, only birds that fly will crash in midair. Snakes will not crash in midair. Is that an argument against the gift of flight? Human group relations, cultural conflict, religion, ethnicity, intelligence, ideological clashes, and Jews—these threads that disgust so many Orthosphere readers serve a wondrous bounty of my interests. What joy! Of course, whenever anyone steps beyond the Markers of Propriety set for respectable people, only disrespectable people share words . . . awkward folks like Sailer, Auster, and Derbyshire who are more interested in matters of truth than faddish notions of politesse . . . and, unfortunately, truly disrespectable folks. Of course, that line of demarcation varies considerably depending on who discriminates. Discussions of Jacob’s patrimony is a beckoning beacon to Jew haters, and they rarely fail to show. Regardless, we must address matters of import sincerely rather than falling into conditioned unthought. Many Jews have taught me so. I wish everyone a joyous feast of the Resurrection. May your Paschatide be full of happiness and wonder. I always enjoy seeing how the Western media cover “our” holidays. Russia Today is not fully Western, but it is geared toward non-Russians and it employs many Westerners. Here is the news segment about the celebration at Christ the Savior Cathedral in Moscow. You may also watch the celebration in Beit Jala, which we visited last year on our way to Bethlehem, and in Ramallah, through which we passed on the way to Jericho. The latter story is on an Iranian site. I find the political propaganda interesting. Lastly, you may wish to see how the Eritreans celebrate the feast. RIA Novosti also has some nice photographs from Christ the Savior. I wish my fellow Orthodox readers a blessed Holy Thursday. May the rest of Holy Week be peaceful and beneficial for you, and may your family and you rejoice in the feast of feasts on Pascha! The article states that ninety percent of Russia’s Airborne Troops are Orthodox. I have read elsewhere that religious observance is much higher in the armed forces than in the society at large. I suspect that such is probably true for most nations. As Fr. Z. states with regard to his own communion, Russia is rebuilding its spiritual house brick by brick. 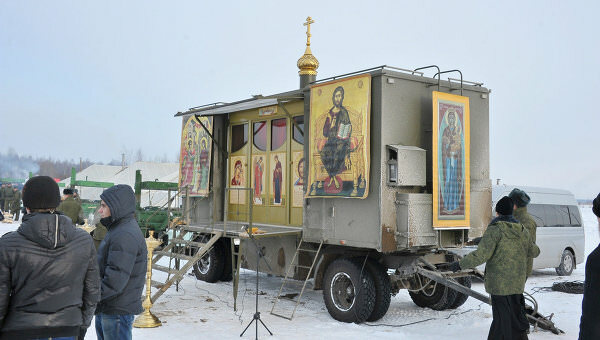 Weapons of Russia has additional pictures of the mobile military chapel. From the story, it appears that ten priests will undergo parachute training so that the Воздушно-десантных войск will have chaplains that air drop with their flying chapel. I wish my Orthodox readers a fruitful Holy Week and my western readers a blessed Bright Week. I wish Fr. Meletios the best in his endeavors to bring an Orthodox version of Alcoholics Anonymous to Eastern Europe and Russia.